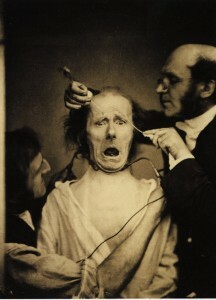 A demonstration of the stimulation of facial muscles by Dr. Duchenne (right). September 17 is Guillaume-Benjamin-Amand Duchenne du Boulogne’s birthday. Duchenne du Bologne was a French physician and pioneering neurophysiologist. Duchenne began his neurophysiology work with a new device called an electropuncture. This device was designed to deliver electric shocks to stimulate muscle tissue using sharp electrodes. He eventually improved the device to perform the same task, but without the stabbing electrodes. Using this device, he began a systematic investigation of the effects of localized electrical stimulation on physiology and therapy treatments. He investigated the cause of several different types of muscular atrophy and paralysis caused by diseased or damaged nerve tissue. Nearly all of his work dealt with the relationship of nerves and muscles. His published works were accompanied by another new invention, photographs. The most famous was The Mechanism of Human Physiognomy. One section of this publication showed how the muscles in a human face can produce facial expressions. He showed smiles produced by happiness are not only produced by muscles associated with the mouth, but also with the eyes. While there is a lot of interesting findings in this book, the photographs made him something of a celebrity. Duchenne employed six different models, including the old toothless man in the above photo. He outlined 13 different basic emotions that were controlled by one or two specific muscles. While most of his colleagues thought he was strange, if not crazy, he continued his research. Eventually, he would publish the accumulation of his life’s work, Physiology of Movements, Demonstrated with the Aid of Electrical Experimentation and Clinical Observation, and Applicable to the Study of Paralyses and Deformations to change his peer’s opinions of his work and gain him the recognition he was refused through his life. 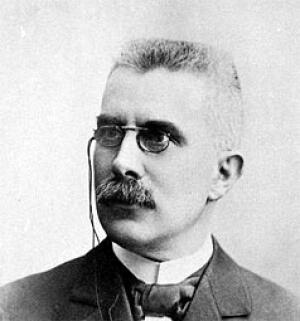 1936 – Henry-Louis Le Chatelier died. Le Chatelier was a French chemist who devised the Le Chatelier principle to describe changes in equilibrium in chemical reactions. He showed how changes in partial pressure, volume, concentration or temperature of a chemical reaction at equilibrium will cause the reaction to compensate for the change. 1905 – Merrill W. Chase was born. Chase was an American immunologist who discovered cell mediated immunology. He discovered that white blood cells trigger the immune response in the body when an antigen appears. This led to the discovery of lymphocyte cells and B and T cells. 1806 – Guillaume-Benjamin-Amand Duchenne was born. 1764 – John Goodricke was born. 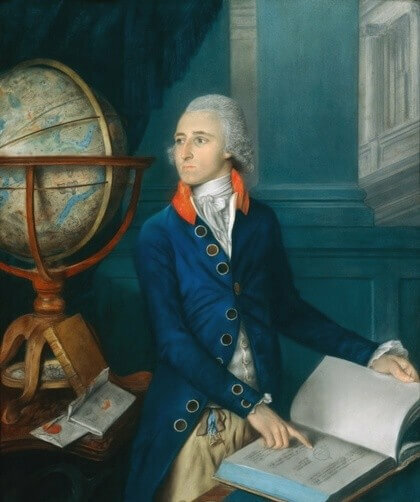 Goodricke was an English astronomer who was the first to propose periodic variable stars were stars with another body orbiting and eclipsing the light from the star. His research on the variable star Algol would earn him entry to the Royal Society just four days before his death from pneumonia at age 21. 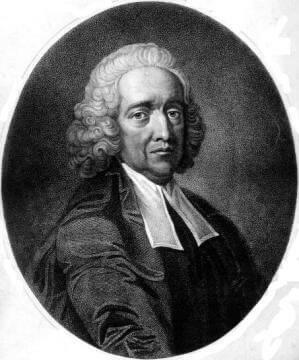 1677 – Stephen Hales was born.